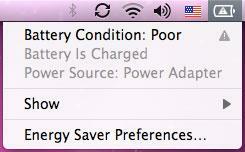 While the immediate charge on a Mac notebook's battery has been available for years, Mac OS X Snow Leopard now tells owners when their batteries are nearing the end of their useful lifespans. Those familiar with the WWDC build of the operating system upgrade note that clicking the battery icon in the menu bar now shows a new, one-word "battery condition" summary in addition to the energy for the current charge and the power source. When the battery has been used often enough that it 's losing capacity, the icon is overlaid with an exclamation mark warning and the battery condition changes to "poor" —both signs that the pack is due to be replaced. While not every condition is known, Snow Leopard presumably reports varying degrees of battery status when the pack has only been moderately used or is like new. The addition partly replaces third-party utilities that sometimes provide a more detailed estimate. Apple hasn't documented the reasons behind the change, but the most logical explanation is simply that the company's decision to seal in most notebook batteries makes it more important to have an early notice that a battery is near failing. A replacement of the sort is easy for technicians but, without the option of swapping batteries in the field, not trivial for end users. Apple has lately been paying closer attention to battery life on all its devices and with iPhone OS 3.0 will add a numerical percentage to the iPhone's previously icon-only battery indicator.